There’s still hope if you haven’t ordered spring flowering bulbs! For all the procrastinators who ignored my advice to order spring flowering bulbs way back in July, I’m sure the mail-order companies still have many, many bulbs for sale, if you are still planning to order some. Well, good news! If my sampling of two garden centers is any indication, the garden centers have actual spring flowering bulbs for sale right now. “Now”, which is admittedly a concept many procrastinators don’t understand, you can overcome your procrastination with a little impulse buying, because you can actually pick out the bulbs you want. You can hold them in your hand. You can pick out the best one! You can buy them and take them home with no delay before your temptation to wait kicks in. So to all who have been procrastinating about buying bulbs, wondering if you should or shouldn’t get them, who to order them from if you do decide to get them, and if you’d even get them planted if you had them, get thee to a garden center and just buy some. You can worry “later”, a timeframe most procrastinators embrace, about if you’ll actually get them planted. And when the time comes to plant, we all promise to remind you… Hortense Hoelove, Dr. Horfreud, and me. Even Thorn Goblinfly will pitch in! But once the bulbs are half price, there should be no more excuses. I love coming home with piles of those little bags stuffed with bulbs. It is exciting just thinking about them. We bought ours from a nursery a couple of weeks ago. I love the bagging up your own type of bulb buying. We planted tulips and daffs for ages at the weekend - spring = hope in my head. I have planted happiness. Plus we are also getting lots of free stuff from a magazine! What's not to love about that? I just posted about ordering bulbs yesterday and thought I was ahead of schedule because I don't plant mine until October. How funny! That's kind of funny! I just impulsively bought a bag of allium, purple sensation, and a bag of parrot fringed tulip bulbs. Can't wait to see them bloom in the spring! I too remember the parrot tulips from years back. Uh-oh, you shouldn't have told me about the 1/2 price sale:) Yes, I'm still procrastinating. But I do have a catalog marked with possibilities to be narrowed down, and the local garden center is fully stocked at the moment. I like to do both--look at the pretty pictures in the catalogs and order some, and also hold some in my hands to choose the best ones at the garden center. I will add to your warning, though--if someone procrastinates too long, the best bulbs at the garden center will be gone. As to your veggie post on Tuesday, I guess I'll say c, except I haven't pulled enough of the dead plants. That was on my to-do list for this week, but the rain has interfered. Carol, I think your rabbits finally got the message! I plan on shopping Sunday for the start of my bulbs. 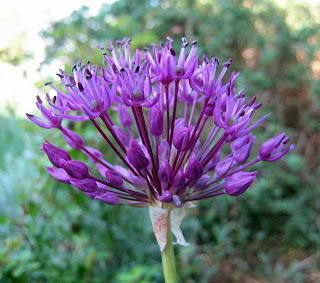 I do plan on ordering from High Country Garden soon for my xeric wildflower bulbs. Thanks for reminding me. I didn't buy mail order but pan to go out this weekend bulb hunting. Since I started blogging I am discovering all kinds of bulbs that do well in Austin and I don't have them. Bulb shopping is so much fun. It brings out the dreamer in the gardener, imagining what all these colors and foliage will look like after a long winter. When I live up north, I would take some into the house for a little winter color. Buy now, buy again later; that is my practice. End of season bulbs work great in my climate, because we don't have frozen ground in December or ever. The chance taken is that the more desirable bulbs will sell out. It makes for a poor garden scene when the planned white daffodils have to be replaced with orange centers and yellow petals, the blue hyacinths with muscari. It makes for a great flower bed if you have room for whatever is on sale, and twice as many as regular priced.